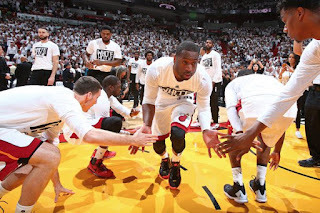 NBA star Dwyane Wade disregards the Canadian national anthem and continues to shoot baskets. during Game 3 playoff. Before the beginning of Game 3 of the playoff series between the Dinos and Heat in Miami, the 34-year-old was caught on camera working on his shot instead of standing still with teammates during Saturday's rendition of O Canada. Wade defended his actions. "I'm not a disrespectful person," Wade said. "So if anybody thinks I'm being disrespectful to a country, then they don't know who Dwyane Wade is."